Cooler Master is a company that branches out into multiple facets of the computing experience. Their products include cases, power supplies, coolers, fans, and a peripheral line that includes keyboards and mice. 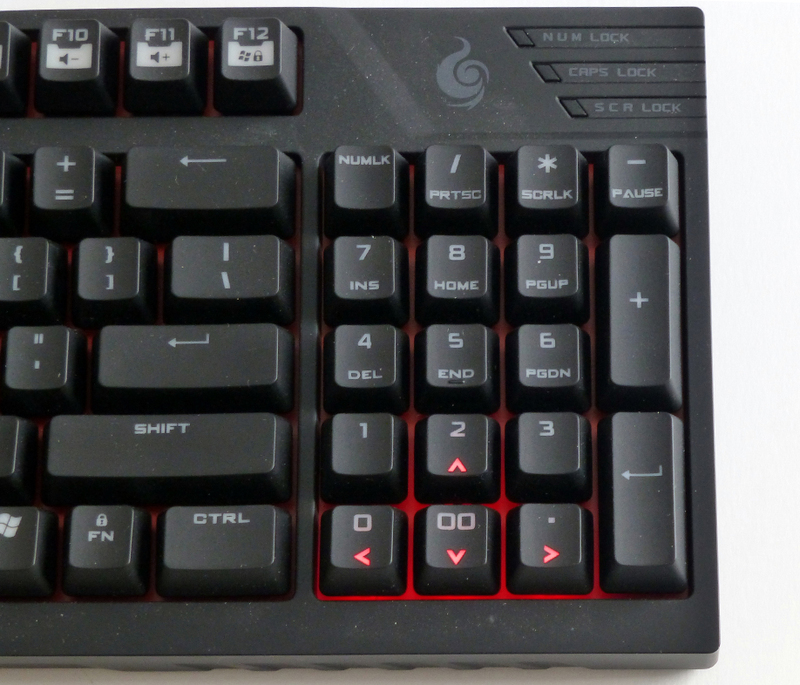 In this article I will be reviewing the Cooler Master Storm Quickfire TK mechanical keyboard, which features Cherry MX Red switches. 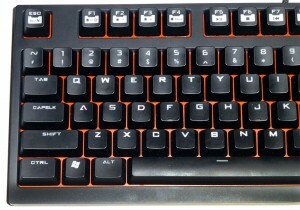 The company also offers the same keyboard with MX Brown and MX Blue switches, each with their own color schemes. For information on the switch specifications, please check my Mechcanical Keyboard Showdown. N-Key Rollover in USB mode means even the wildest key combos are registered perfectly. Detachable braided USB cable and cable routing grooves at the underside of the keyboard for easy cable management and better flexibility. 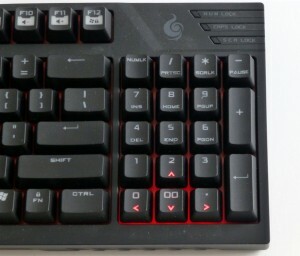 The Quickfire TK’s unique NumPad block design merges both navigation and command keys. 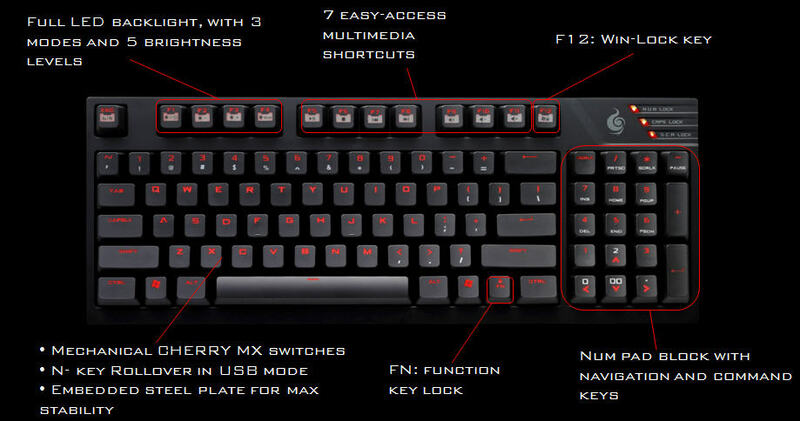 You get a compact gaming keyboard with NumPad block. Upon opening the box and plugging the keyboard into the computer, Windows 7 found and installed any necessary drivers automatically. No special software was needed to use any of the features the keyboard has to offer. I appreciated that the Quickfire TK takes up less space on my keyboard tray due to the combined NumPad shrinking the width of the keyboard into a tenkeyless form factor. For those that do not know, a keyboard with a tenkeyless design has truncated all of the keys to the right of the arrow keys. 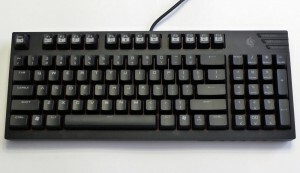 An example of this is the Filco Majestouch 2 Tenkeyless. Following the hassle-free installation, I played around with the various function key controls, such as changing the backlight pattern and brightness levels. 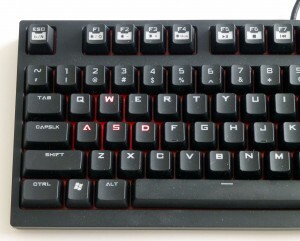 Once I was happy with the red light coming through only the W-A-S-D keys, I loaded Battlefield 3 to get a feel for the Cherry MX Red switch sensitivity. All of my controls felt responsive, and with the low (45 g) actuation force required with the Cherry MX Reds, I never felt any finger fatigue. This held true even when holding down keys to run or when using any of my other key binds. The lack of finger fatigue was a nice change in contrast to my previous testing with Cherry MX Black switches, which required 65 g of actuation force. After I satisfied my First Person Shooter itch, I switched over to Guild Wars 2 – my current MMORPG of choice. Here again I had no issues with responsiveness. I was able to run around and dodge, and at the same time use any combination of abilities, and continue chatting with guildmates with no problem. All of the keys worked exactly how I would expect them to, with no missing actions. 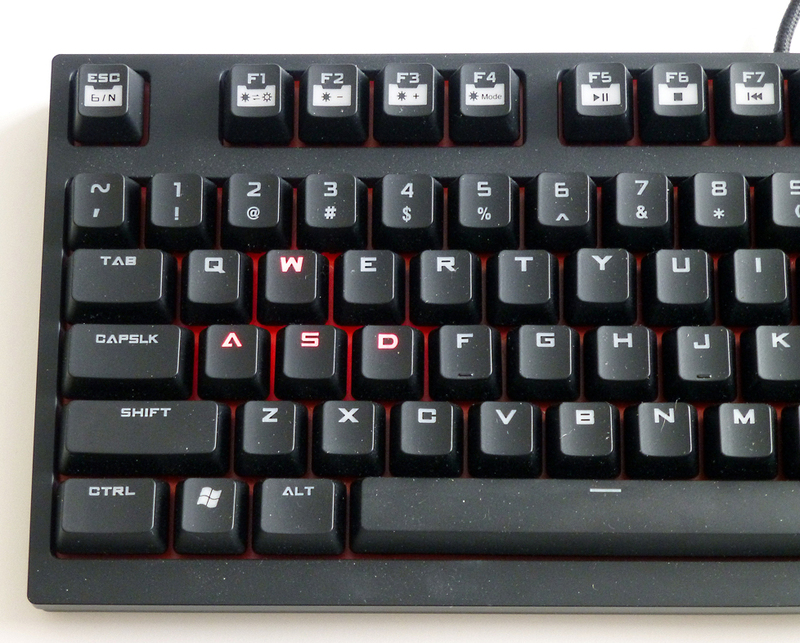 Once I finished playing games I began using the keyboard for writing this review. I performed some data entry in Excel, and some general forum posting. After hours of typing, I still did not feel my fingers tire from typing. The only hindrance that I could find with the keyboard was in relation to the combined NumPad. Because the arrow keys are built into the NumPad, it required me to constantly turn NumLock on/off in order to switch between the functionality of being able to quickly move the cursor to where I want it, and then to go back to typing in numbers. Since the Quickfire TK is meant to be a gaming keyboard more so than a productivity keyboard, I can’t hold it at fault for having a feature that isn’t available in other tenkeyless keyboards. If you will be needing to do both, a tenkeyless sized keyboard may not be the best option for you. 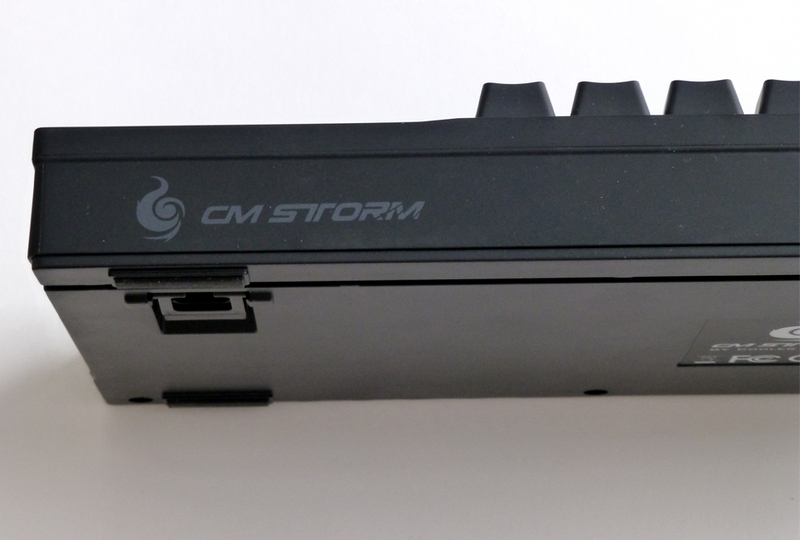 Instead, I would recommend looking at CMStorm’s other offerings, such as the Quickfire Pro or Trigger. 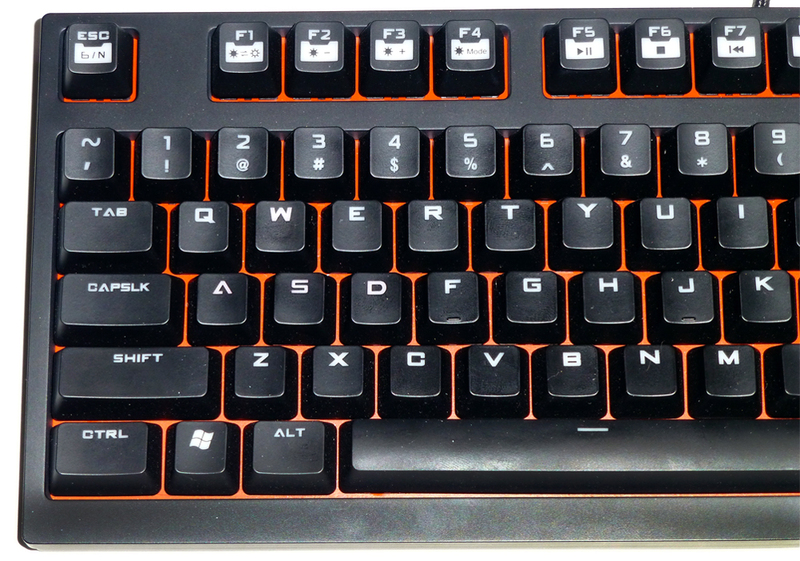 The Cooler Master Storm Quickfire TK is a excellent example of a mechanical keyboard made for the gaming population. It can be purchased with three different Cherry MX Switches (Red, Blue, Brown), with each switch having their own characteristics. Throughout my testing with the peripheral I never noticed any problems with the device not working the way it was intended. It behaved flawlessly in all of my gaming sessions, independent of the game and genre. The keyboard did have one caveat during productivity usage. While general typing was a breeze, working in spreadsheets could prove annoying if you consistently need NumPad for arrow keys and the numbers. 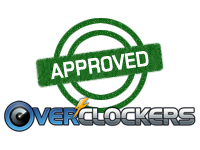 All things considered, for under $100 the Quickfire TK is a great keyboard for its targeted gaming market, and for that it earns the Overclockers.com stamp of approval. Was a fun keyboard to use, thanks CoolerMaster for the sample! looks pretty good. If my current MS Natural Elite ever gives up the ghost, this may be the keyboard for me. Does it have the capability to use PS/2 via an adapter or are we limited to USB only? I do not know 100%, it doesn't specify online but I couldn't imagine that not working, but because it can do all of the functions (including nkro) would you need a PS/2 port? got my Blue one the other day. Only thing i can say that i hate about it is that you have to press the numlock key on/off to get to the arrows, and on/off again to get to the +/- of the number pad. Pain to overclock with lol. otherwise, i love it, especially the different LED schemes. PS/2 is superior to USB. N-Key rollover usually is not all the keys and only a few commonly used such as q to r, a to f and the number keys. PS/2 allows all keys to be pressed at once regardless of which ones. Does this board have NKRO across the entire board via USB? And a lot of newer mechanical keyboards do not have the capability to use PS/2 even with an adapter. The Razer Black widow does not work over PS/2. The Quickfire Rapid is a filco re-brand so it does have PS/2. I'll test it out for you tonight. The keyboard didn't come with a ps2 adapter though so I will have to see if I can scrounge one up. Ya, that's what I find weird because my Quick Fire Rapid came with one and works with PS/2. To be fair, the box that I was sent wasn't a full retail box (it was a white box with the keyboard in it, came with a key remover though). I could be wrong and may have just mis-placed it. tried out nkro over USB and I couldn't find a combination of 6 keys that wouldn't all recognize while being pressed. If you have any suggestions on combinations I'm happy to try them. I found a USB->PS2 adapter and it did not work (rebooted PC with it plugged in and it didn't recognize it). Did you try 6 key combinations away from the gaming cluster? Ya that's what I suspected.